Sub:- SE- RMSA-Self Defense for the year 2017-18 — Supply and distribution of Self Defense Module to 5605 Secondary Schools- Orders -Issued-Regarding. Read:- 1. This office Procs. Rc.No.5101/AWP&B/9.1/RMSA/2017,dt.06. 11.2017. 2. This office Lr.Rc.No.5101 /AWP&B/9.1/RMSA/2017, dt.06. 11.2017 to Om Art Printers, Vijayawada. Further they are informed that, the Self Defense module are printed and will be reached to the District Head Quarters in 02 to 03 working days. 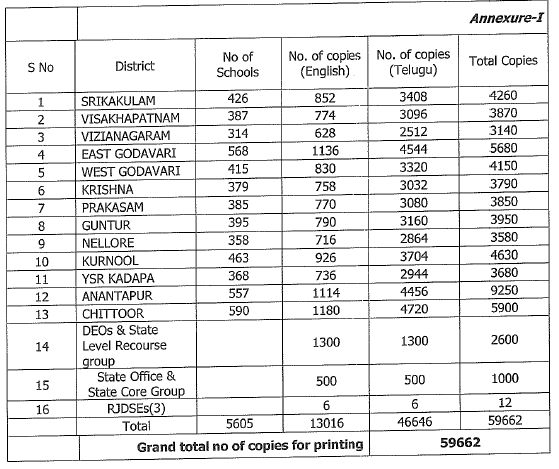 Hence, the name and contact numbers of Superintendent of RMSA and office mail Id’s have been informed to the M/s.Om Art Print, Besent Road, Vijayawada to hand over the modules as per the annexure. Therefore, all the District Educational Officer & Ex-Officio Project Coordinators of the RMSA in the State are hereby directed to collect and supply! distribute the self defense modules to the school point (schools list enclosed ) through the Dy.E.Os. concerned from the Transport agency and Acknowledge the same to this office immediately in both soft and hard copies. The printed modules have to be reached to the school point immediately as and when the District Head Quarters received.